The use of modern technology allows operations to be performed through keyhole incisions and has advantages over conventional surgery, as the ankle responds badly to open incisions, and complications of open surgery are common. Ankle arthroscopy is performed under a general anaesthetic as a day-case procedure. 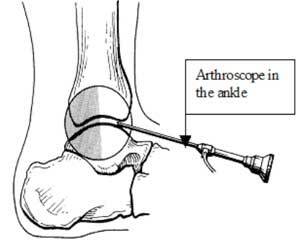 During the surgery an arthroscope (a small telescope approximately three to four millimetres in diameter) is inserted into the ankle through two or three small puncture wounds. This allows the surgeon to see and operate inside the joint. Operations can be on the soft tissues and the bone, including removal of bony spurs, damaged cartilage and inflamed soft tissue. The padded bandage should be removed 48-72 hours after surgery. The puncture wounds will have a stitch or Steri-strip tape keeping the wound edges together, plus a clear adhesive dressing. KEEP THIS INTACT UNTIL YOUR FOLLOW-UP APPOINTMENT at 10 days. Keep the ankle dry for 2 weeks following surgery. You may take a shower after 48 hours provided the wound is kept dry. SEVERE PAIN, MASSIVE SWELLING, INFLAMMATION OR DISCHARGE SHOULD BE REPORTED TO YOUR GP. If you cannot contact your GP you should contact the hospital or my rooms. You will be given a tubigrip support to wear after you have removed the bandage. Wear the tubigrip support during the day, but take it off at night. Your ankle may ache and swell after arthroscopy and you will probably need to take some painkillers for the first few days. Wearing the tubigrip bandage and applying ice packs will help to reduce the swelling. Ice packs can be applied twice a day for ten minutes. Protect the skin with a damp towel and use a bag of frozen peas. When you are resting you should keep your leg elevated, on a stool or on a chair, to help keep the swelling down. It will take at least three weeks to recover to your pre-operative state if a soft tissue procedure has been performed and twice this time if bone has been removed. The scene is then set for recovery, which will take as long again. Return to work when your ankle feels comfortable and you are confident your ankle will be able to stand the pressures of your job. If you have an office-type job you should be able to return to work within seven days; if your job is strenuous and involves a lot of walking then you will probably need two to three weeks off work. Driving is usually possible after seven days when your ankle is feeling comfortable. Make sure you can operate the pedals without pain. Check that you can preform an emergency stop safely. You should notify your insurance company. Strenuous physical activity and sport can be resumed when your ankle is feeling strong, comfortable and no longer swollen, usually four to six weeks, but this depends on the type of surgery carried out. Gradually increase your level of activity before returning to competitive sport such as football, netball or rugby. Make sure you can hop and sprint with changes of direction, and make sudden stops and starts – all without pain. The success rate of surgery depends on the disease that is requiring operation. It varies from 60 to 95%. 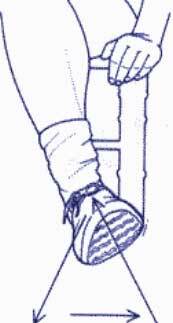 There is a small (about 1 in 600) risk of serious infection, this can involve and damage the ankle joint. A small number of people will get some numbness or tingling on top of the foot as a consequence of damage to small nerves in the skin. Usually this is temporary, but sometimes it can give rise to a permanent numb or sensitised area. Occasionally surgery is required to remove the damaged nerve (neuroma). Other possible complications include blood clots (deep vein thrombosis) and medical complications from the anaesthetic.